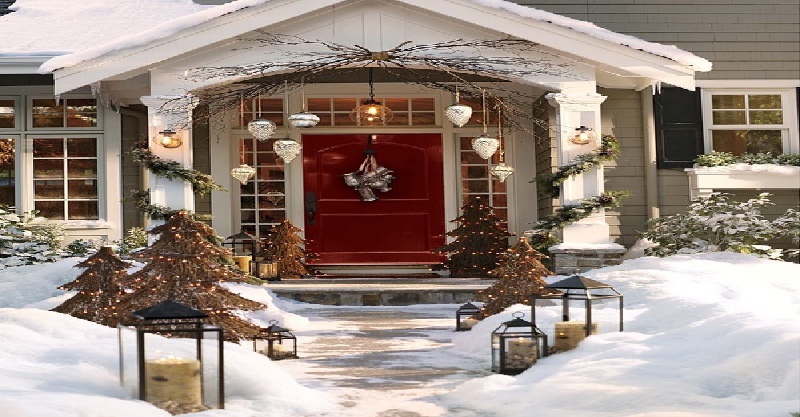 Christmas front door décor is a fascinating way to both spread some extra Christmas magic and get your home ready to welcome guests for the holiday season. Whether traditional or with a modern twist, there is a plethora of options to brighten up your front door and the space around it. 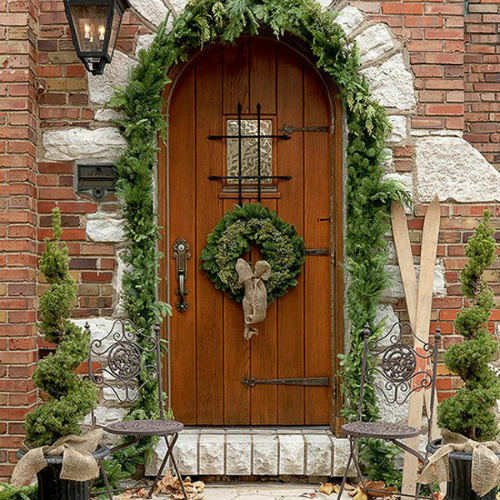 Wreaths, garlands, Christmas ornaments, snowflakes, stockings, snowmen, stars, topiaries, and light and flower displays are the classic elements to use when decking your front door. As for the colors, the traditional ones to make your front door sparkle are green, red, white, silver, and gold. However, you can get creative, start thinking outside the box, and come up with unique, enchanting front door décor. Whatever way you opt for, a beautifully dressed-up front door can definitely create a welcoming mood and a magical, festive Christmas atmosphere. Unquestionably, wreaths are a favorite choice for year-round front door décor. 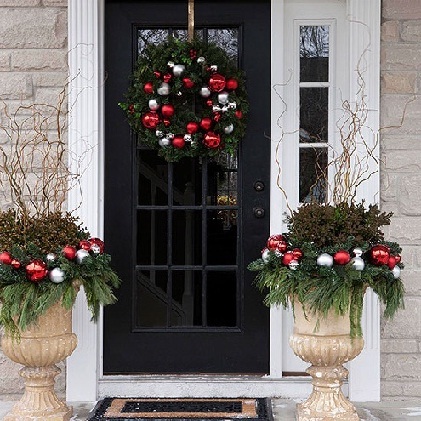 Simple or beautifully ornate, with a rustic or organic vibe, easy-to-do DIY projects or customized options, made of flowers, evergreens, papers, ribbons, or fabrics, wreaths offer a traditional and affordable yet elegant, adorable way to embellish any front door and add visual interest and personality. Hence, when it comes to Christmas front door décor, wreaths are the first thing that comes to mind. Used alone or complemented by garlands and Christmas ornaments, wreaths are definitely a key element of front door Christmas décor. Actually, in terms of materials and colors, Christmas wreath options are practically endless. From the traditional ones made of evergreens, pinecones, and ribbons to flower, grapevine, and snowflake wreaths to unconventional ones, the choice is yours. They are the required ingredient for perfect front porch Christmas decorations. In the picture above, front door decoration, which is the epitome of the traditional Christmas décor in terms of colors and materials. A wreath in green, red, and white is complemented by matching topiaries flanking the front door. Simple yet so elegant and sophisticated! When decorating, always consider creating symmetrical décor, it lends an elegant, refined look. Above, a garland made only of evergreens highlights the unique front door of this home with stunning exterior. A simple wreath complements the garland. A pair if matching spiral evergreen topiaries and metal chairs add a sense of symmetry and balance. Definitely décor with an organic, sophisticated look! Note that garlands are versatile décor. Usually complemented by ribbons, bows, and Christmas ornaments , they are the perfect option for decking staircase railings. In addition, they can be used to both embellish and accentuate columns flanking the front door. Wreaths made of Christmas tree ornaments are a classic, favorite choice. Usually multi-color, they can add sparkling beauty and festivity to any front door. Above shown is a unique triple wreath made of vibrant Christmas ornaments. What a way to create bold, one-of-a-kind décor! Truly impressive! If trying to add extra doses of personality to your front door décor, opt for a swag. Generally, swags offer a charming, informal alternative to classic wreaths. In the picture above, an adorable swag in the classic Christmas colors. 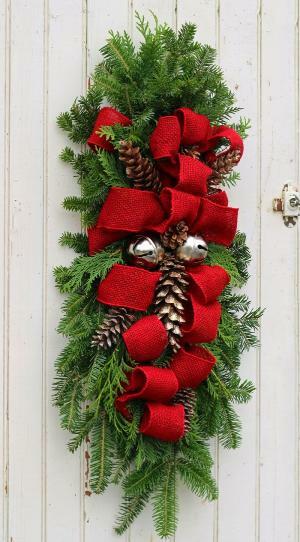 Made only of evergreens, pinecones, a vibrant burlap ribbon, and bells, this swag offers an easy and affordable yet impressive way to embellish any front door for the holiday season. As it adds vintage charm and an organic feel, always consider incorporating burlap in one way or another in your Christmas décor. Except for making wreaths and complementing other décor items, Christmas ornaments can be used in an array of other ways. 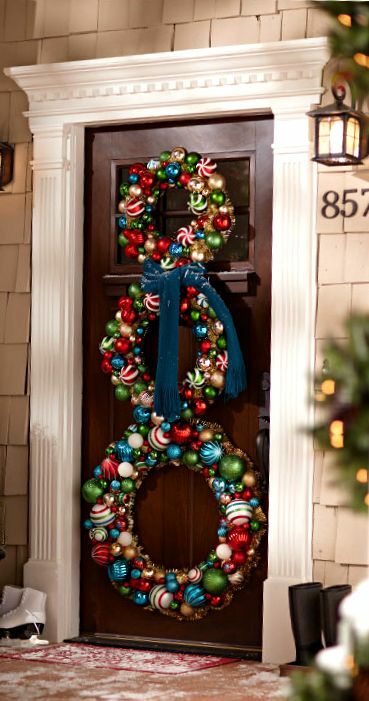 Tied together, hanging on ribbons, Christmas ornaments definitely make dazzling front door décor. Speaking of Christmas décor, more is merrier! In the picture above, an intriguing Christmas display. Red ornaments of different size for extra visual interest complemented by bows and ribbons create this absolutely breathtaking Christmas front door décor. Actually, nothing says Christmas better than sparkling lights! Furthermore, any kind of décor would simply look incomplete without lights. Incorporating lights in your front door Christmas décor can definitely help add extra doses of the magical holiday atmosphere. Whether to outline windows, highlight decorative columns, or use a pre-lit garland or wreath to embellish the front door, there is an array of ways to use lights. Plus, lights work well for outlining the walkway and stairs to the front door. Get creative, you can always find some unexpected places that can benefit from some lights. Adding lights to planters flanking the front door, glowing globes of varying size arranged in different containers, or hanging baskets lit from within are fascinating, favorite options that can add sparkle, undeniable charm, and tons of personality. When it comes to lights, safety comes first. Make sure the lights are suitable for outdoor use. Generally, battery-operated lights are a surefire choice. In the picture above, a doorway dressed up in the traditional red-and-green color scheme. 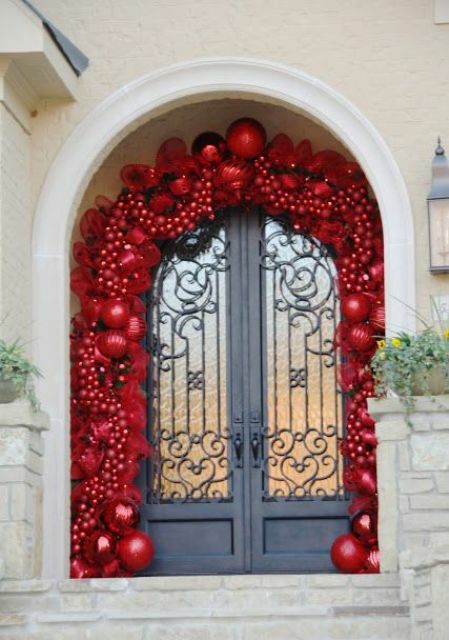 Red ribbons and bows and sparkling lights complement a garland, which outlines the front door. A matching wreath adds extra festivity. 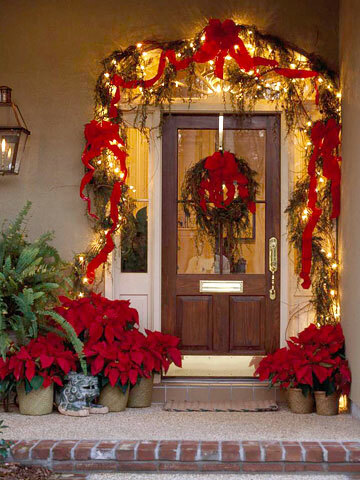 Grouping of poinsettias, a classic Christmas décor element, complete this fabulous front door décor. Unquestionably, a plethora of ways helps create Christmas front door décor, traditional or with a modern twist, which delights our senses and spreads dashes of holiday magic. Unleash your creativity, even carefully chosen doormats can add extra festivity to your front door décor. Christmas trees are a quintessential part of the seasonal décor, so, incorporating a tree in one way or another is a smart choice. Whether a live tree, any kind of an artificial stylized one, or a pre-lit tree for extra visual interest, it makes the Christmas magic! Strategically positioned, figures of Santa Claus, his reindeer, and snowmen/especially when creatively lit/ complement Christmas trees and help create statement front door Christmas arrangements. Being a symbol of Christmas, poinsettias also make attention-grabbing seasonal arrangements. Groupings of oversized candy canes, snowflakes, beautifully wrapped gift boxes, and Christmas ornaments or letter designs also offer a fabulous way to both create unique décor and add tons of charm and personality to your front door area. As they add visual interest and help create dynamic displays, hanging arrangements are a fascinating option. Whether made of pinecones, huge stockings filled with sweets or small faux gifts, candy canes, Santa hats, mittens, or snowflakes, front door hangings offer a charming way to deck any front door for the holiday season. 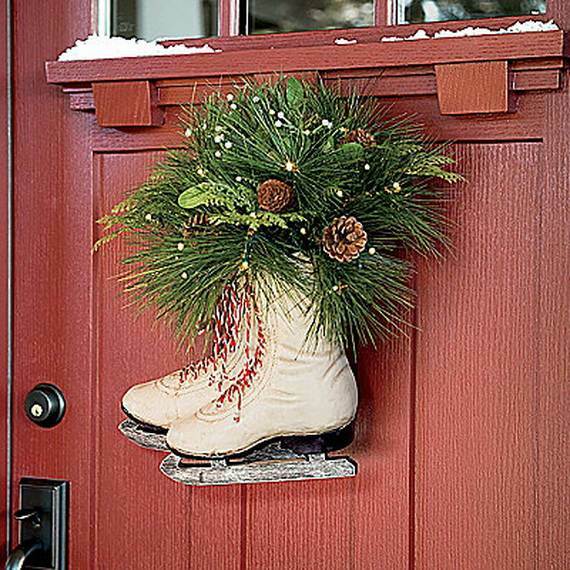 Hanging ice skates/especially a pair of vintage ones/ full of greenery, wrapped faux gift boxes, or other décor items is a stunning alternative to wreaths to add seasonal interest to any front door. For a definitely unique front door décor, you can try with a vintage pair of Santa boots. In the picture above, a pair of ice skates filled with greenery and pinecones makes a simple yet fascinating front door Christmas décor. Note that incorporating vintage items always adds extra doses of special charm and personality to any front door seasonal décor. Displays that include skis, decorated sleds, lanterns, and logs always create a homey feel and are a stunning way to welcome your guests during the holiday season. Above, traditional front door Christmas décor. A pair of matching lanterns flanks the front door, which is embellished with a modest wreath made of evergreens. An untrimmed fir tree, a basket of logs, a sled, and a bag of wrapped boxes create a simple yet fascinating display with a distinctive organic vibe. Always consider including lanterns and candles, they definitely add unmatchable charm to any front door Christmas display. Trying to find something different? 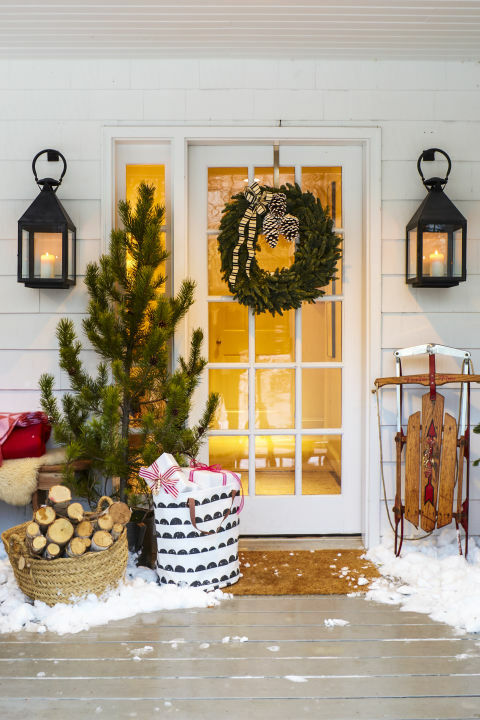 Then, go beyond tradition and choose monochrome front door Christmas décor. 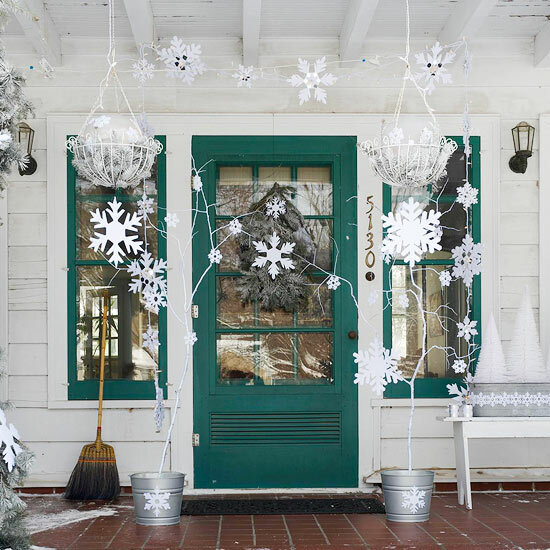 Above, a fascinating all-white front door Christmas décor. Hanging snowflakes and baskets with sparkling orbs, miniature Christmas trees, faux trees planted in galvanized buckets, which flank the front door, twinkling lights…It is pure white magic! Traditional or with a modern take, front door Christmas décor is a stunning option to add some extra doses of festivity, sparkle, charm, and personality to your home for the holiday season.